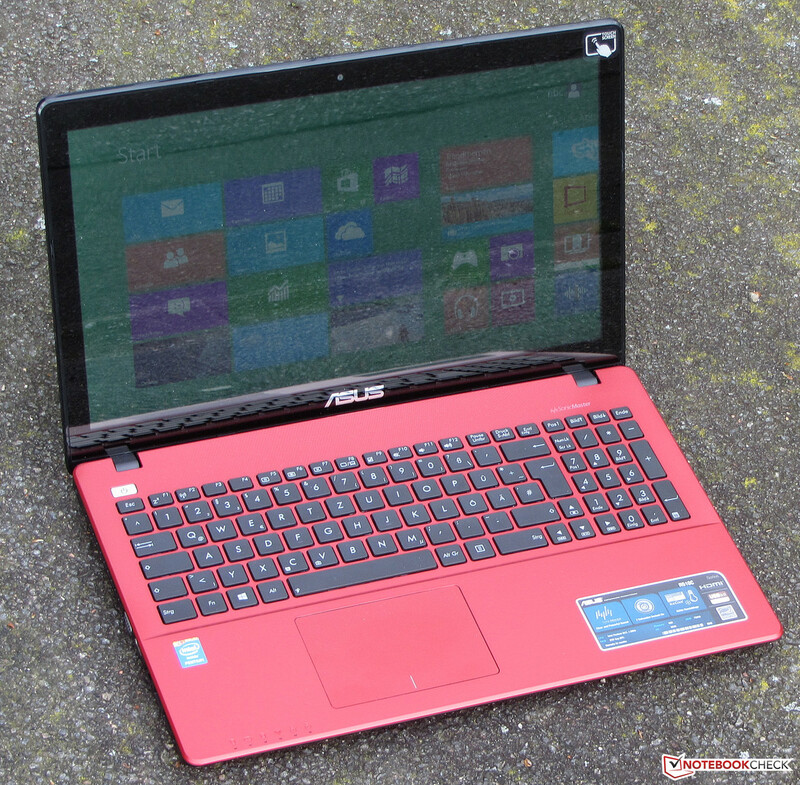 Asus' R510CA is a simple 15.6-inch office notebook. Even if its technology is not quite up-to-date, its red case certainly has its appeal. To position the notebook relative to its competitors, we will compare it with the Acer Aspire E1-572 (Core i3-4010U, HD Graphics 4400) and the Lenovo IdeaPad Flex 15D (AMD A6-5200, Radeon HD 8400). 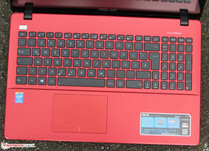 We are already acquainted with this notebook, as it is structurally identical to the models in Asus' X550/F550 series. Due to this fact, we will not discuss the case, connectivity options, input devices, display or speakers at length -- unless there are differences. You can find more information on these topics in our reviews of the X550LD-XX023H and the F550CA-XX078D. The most striking difference between the above-named structurally identical notebooks and our review device is the case color: Asus dresses their computer in a muted red that is unlikely to bother even those who prefer more conventional notebook colors. There is another small difference on the back of the lid: The lids on the X550LD and the F550CA have a grooved texture with circles rippling out from the center. The R510CA, however, is not textured and instead is imprinted with the same pattern. 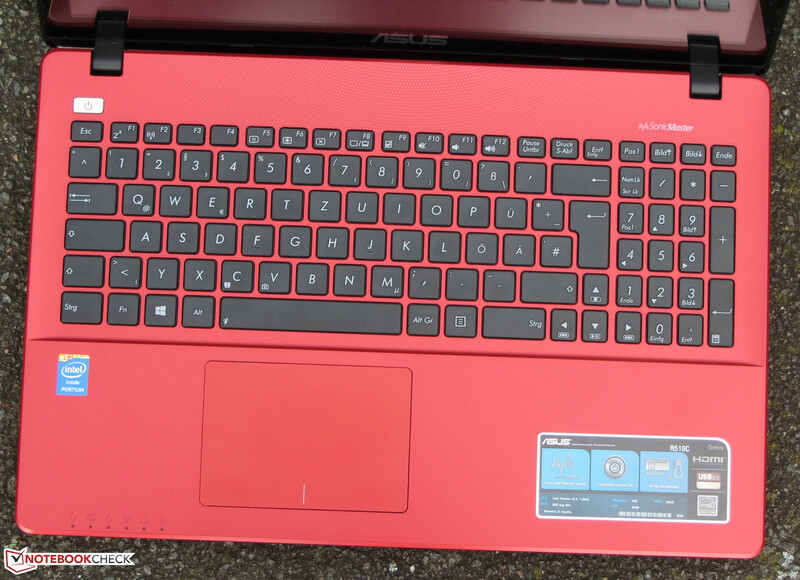 The back side of the lid is glossy (image: Asus). Asus equipped their R510CA with a touchscreen with 10 touch points. The screen functions perfectly and reacts to input promptly. The same display Asus used in the X550LD-XX023H resides in the R510CA. Nevertheless, our measurements differ somewhat. This is normal. Two structurally identical panels are never 100% alike. Additionally, the R510CA's actual display sits behind the touchscreen. At around 200 cd/m², Asus' panel is not especially bright. At 366:1, its contrast is acceptable, and for a device in this price class, its color reproduction is reasonably good as well. Outdoors in the sunlight, the panel is plagued with reflections that obscure the display content. 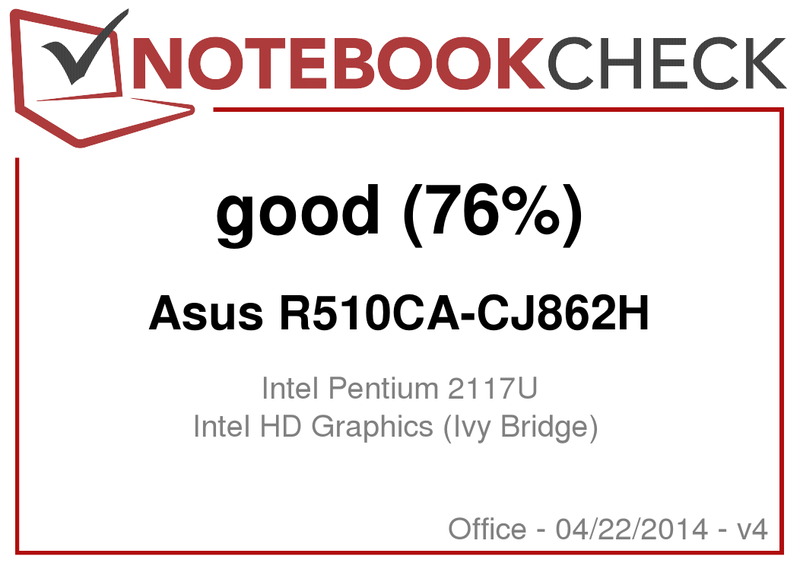 The R510CA is one of Asus' simple 15.6-inch office notebooks. The computer is intended for use in the office and is able to perform simple tasks like surfing the Internet, Skyping, word processing, or watching videos. 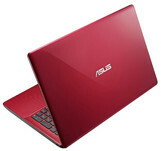 The attracting feature of the notebook is not so much its computing power as its red case. The device is currently priced at around 400 to 450 Euros (~$550 to ~$620). The R510CA runs on an Intel Pentium 2117U processor. This is a dual-core CPU that is still based on Ivy Bridge architecture. The processor runs at a speed of 1.8 GHz and has no turbo. It belongs to the class of ULV CPUs and has a TDP of 17 Watts. The CPU completes the Cinebench benchmark's CPU tests at full speed in both AC power mode and battery mode. When it comes to the notebook's system performance, there is nothing to complain about: It runs robustly and fluidly. The results in the PCMark benchmarks are good as well, though its two competitors offer better numbers here. The Aspire is outfitted with a stronger CPU and a stronger GPU. The IdeaPad profits from its hybrid hard drive. The Seagate hard drive at work in our review device provides 750 GB of space for personal data and runs at 5400 rpm. All in all, the results from our tests are more or less what we would expect nowadays from 5400 rpm hard drives. The HD Graphics (Ivy Bridge) graphics card is responsible for graphics output. 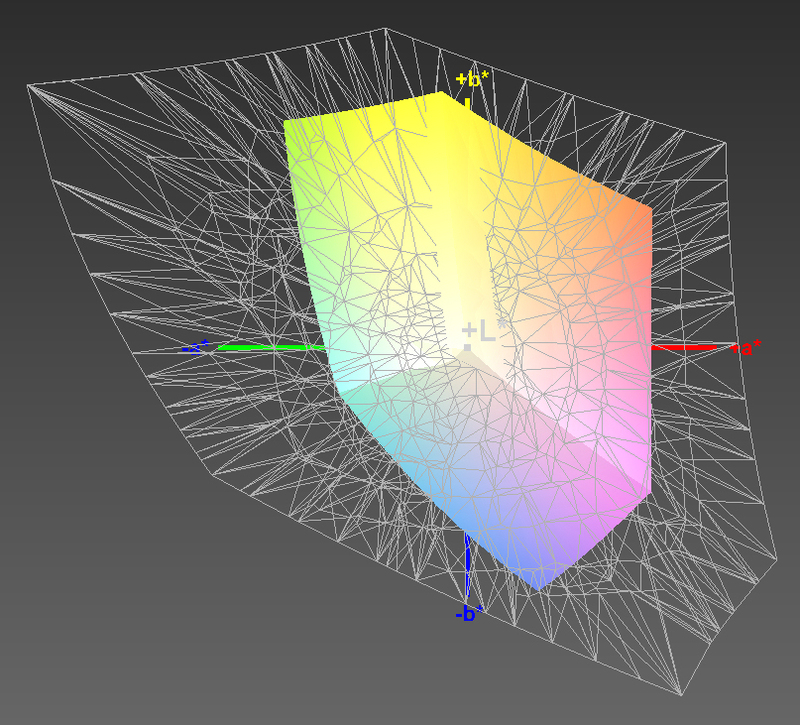 The GPU supports DirectX 11 and runs at a speed of 350 to 1000 MHz. In the 3DMark benchmarks, the R510CA falls behind its competitors. Both are equipped with stronger GPUs. The computer was not created for playing computer games. A few titles play fluidly at low resolution and low quality settings. The notebook has more of a chance with games that demand little of the hardware -- for instance, FIFA 14. The Aspire and the Flex 15D produce higher framerates, but by no means can either be called a gaming device. If you would like to be able to play games, Acer's Aspire E1 572G represents a cost-effective alternative. Because the R510CA is outfitted with an energy-efficient ULV processor, it follows that the notebook will need little cooling, and thus go about its work quietly. Our measurements confirm this. Whether the computer is in idle mode or under full load, the device hardly makes a sound. Even during our stress test, the fan only runs at a moderate speed. The Aspire is considerably quieter yet. The IdeaPad produces more noise. None of our three competing devices heat up substantially. The case temperatures are in the green everywhere we measured -- both in idle mode and during the stress test. The R510CA completes the stress test (Prime95 and Furmark running simultaneously for at least an hour) in the same way both in AC power mode and battery mode: The CPU and GPU run at full speed (CPU: 1.8 GHz; GPU: 1 GHz). 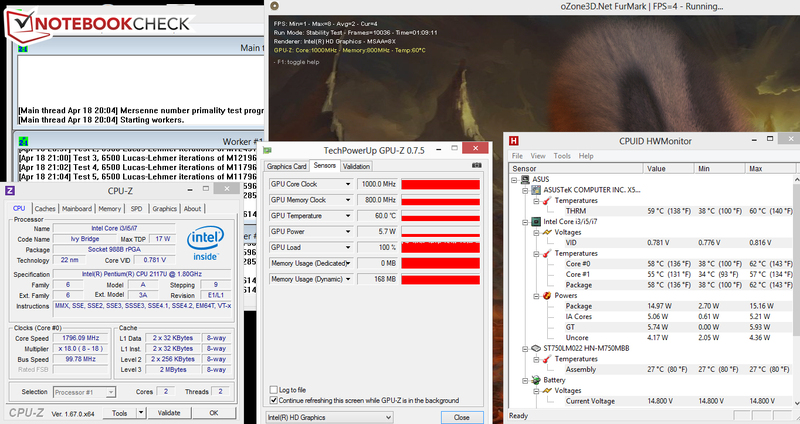 During the stress test, the CPU temperature leveled off at about 58 °C (136.4 °F). The computer's energy-consumption rate corresponds to what we would expect of a 15.6-inch notebook with an Ivy Bridge ULV CPU. The Aspire proves to be more frugal with its energy usage overall, even though it has a stronger processor. However, that is not surprising, as the Acer computer is equipped with a Haswell CPU. Haswell processors consume less energy than their predecessor models from the Ivy Bridge generation. In the WLAN test, which is meant to simulate practical, everyday use, a script automatically loads new websites at 40-second intervals. The energy-saving profile is activated, and the display brightness is set to about 150 cd/m². The R510CA reaches a battery runtime of 2:58 h in this test. This is not a very good result. We would expect more of a notebook with a ULV processor. The IdeaPad chugs along for 3:46 h. We were unable to run this test on the Aspire. The Asus R510CA has enough performance power to handle all the usual everyday tasks. That includes surfing, Skyping and word processing, for example. The notebook does a good job with video playback as well, and even during that operation it always runs quietly. Additionally, the computer offers a lot of storage space for the user. Not to forget: The red case looks very good. However, the battery life in our WLAN test (which is meant to simulate practical, everyday use) certainly leaves something to be desired. We expect a great deal more from a notebook these days. The display also deserves some criticism: Its brightness is below average, and its contrast is mediocre. That is our objective assessment of the computer. In principle -- besides the case color -- we see no reason to buy this notebook. It is not especially cost-effective, technologically it is behind the times, and none of the measurements we took proved to be especially phenomenal. There are better notebooks available for less money -- the Aspire, for example. The Acer Aspire E1-572 gains points for its matte Full HD display. It is also equipped with the strongest processor and simultaneously happens to be the most inexpensive of our three competing devices. 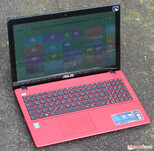 Without a Windows operating system, the notebook is currently available for about 390 Euros (~$540). The Lenovo Ideapad Flex 15D's unique feature is its display that rotates up to 300 degrees. The red case and that the notebook runs quietly. A better battery life and a better display. In 2014, notebooks with Ivy Bridge processors are still being put on the shelves. Acer Aspire E1-572, Lenovo IdeaPad Flex 15D, HP 255 G2, Acer Aspire E1-532, Lenovo IdeaPad Flex 15, HP Compaq 15-h024sg, HP 250 G2, Toshiba Satellite C50D-A-10E, Acer Aspire E1-522.